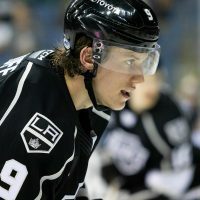 The division rival San Jose Barracuda were in town for a Friday night faceoff with the Ontario Reign. Both teams were coming off a win and looking to start a streak, but for largely different reasons. San Jose has it eyes on the top seed in the Pacific Division while Ontario was looking to play as much winning hockey as possible as the season approaches its end. San Jose jumped out to a 2-1 lead in the early going after the Reign coughed up four or five pucks into their own slot. Kale Clague tied the game on a PP marker with minutes remaining and the first period ended knotted at two. The Reign killed of a (weak) penalty call to start the second period, but allowed SJ to grab the go ahead goal just seconds later. Sheldon Rempal never met a goal-fest he didnt’ want to be a part of a joined in on the festivities on a beautiful individual effort to knot the game at 3. The goal was his first in over a month. Just a moment later Nikita Scherbak buried a Philipe Maillet pass to get the Reign their first lead of the night. Scherbak and Maillet then set up Sutter for one of his own and the Reign lead was two goals. The third period opened with the Reign trying to ward off SJ and win consecutive games for the first time since November. San Jose started the period with a strong push that didn’t pay off, but found paydirt later in the period. Alex True scored his second of the night to make it 5-4 Ontario. Mike Amadio scored after a long offensive zone presence to push the lead back to two goals. Rempal got his second of the night just seconds later to make it 7-4. 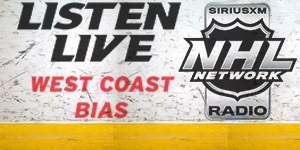 Moulson added an empty netter on an interesting call by SJ Head Coach Roy Sommer to make it 8-4, the final score. Ontario will finish out their three-game weekend with a pair of games against the visiting Iowa Wild. Citizen’s Business Bank Arena will host both games, Saturday at 6pm and Sunday at 3pm. 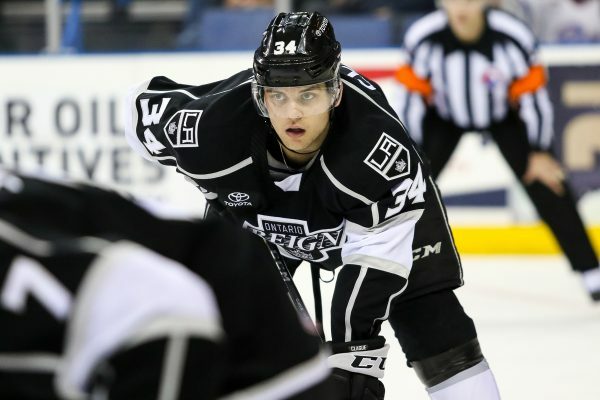 Kale Clague: Clague, the sixth ranked Kings prospect, has had a decent year in Ontario. 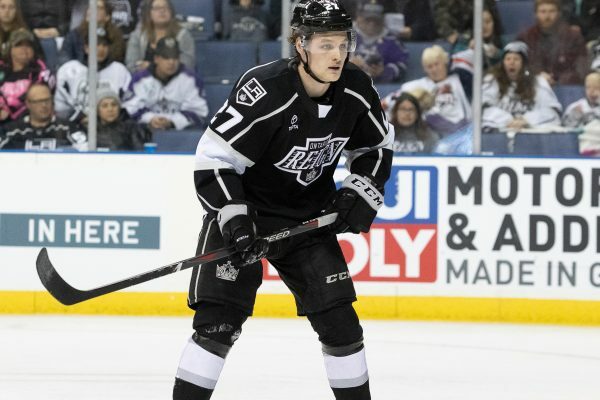 His first pro year, Clague has had the chance to play important minutes for a Reign team with tons of opportunity on the back end. He has six goals and 21 helpers for 27 points, three points behind Matt Roy for the team lead for defenseman. Clague’s ability tom move his feet and move the puck has shown through for the Reign, but likely has not reached it’s full potential at the AHL level. His instructions have been to shore up the defensive end of his game since he was drafted and he has worked hard to do so. 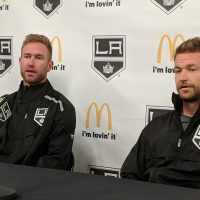 Sean O’Donnel works with the development team for LA and thinks Clague is well on his way to the NHL. He is ranked sixth, but could easily swap places with fifth ranked prospect Mikey Anderson depending on who you talk to. Here is more on Clague and Anderson. Cal Petersen: While we provided an update on Petersen last time around in Ontario, there is good reason to keep tabs on the young goaltender. 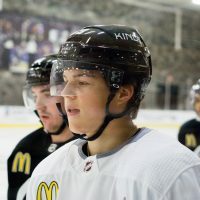 He was recently named as the most valuable prospect in the entire organization. 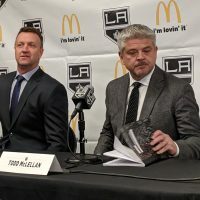 With Jonathan Quick trade talks only poised to heat up, Petersen’s value to the Kings will continue to rise. After a stellar 2017-2018 season in Ontario, the sledding has been much tougher this year for Petersen and the entire squad. An example, through 41 AHL games last season Petersen stop 1010 shots and had a .910 save percentage. Leading up to Friday, he has stopped 815 pucks in just 26 games (.895). The stats dont reflect the players performance accurately, and the much younger Reign team surely had more holes than in years past. In 11 appearances for the Kings this year, Petersen in 5-4-1 with a .925 save percentage. He made 52 saves on 56 shots (.928) in the Reign win Friday night for good measure. We think the true player is more the latter than the former, and Kings fans may have the chance to decide for themselves next year in LA. More on Petersen. Yeah it was a good win. I thought our group battled hard and we stuck with it all game. Obviously there were some tough bounces earlier in the game but I thought we did a great job of sticking with it abd getting the two points. I think I’ve come a long way. Earlier in the year I had some bad habits that I needed to break. [They were] Junior habits that needed to come out of my pro game. I thought I’ve been steady, gradually and I’ve continued to get better throughout the course of the year. I’m getting a lot more opportunity with some guys being up. It’s important for me play well in those minutes and take advantage of the opportunity. It was a great win tonight. Personally I need to be a little bit better tomorrow , but a great win. More of the same. A little more assertive in the defensive zone. That was a big thing that the development staff and coaching staff wanted me to work on. Getting back hard for pucks is a key to my game. [As well as] making a good first outlet pass and creating offense, but being solid and steady in my own end. It was a little bit of a wild one. Kind of a high scoring affair and a lot of shots. I didn’t feel like there was a ton of room out there. But I think our line was clicking and I think it was an all around good team win tonight. I think it’s just staying focused. You cant get too down on yourself. In pro hockey you can go though a lot of ups and downs. You’ve got to stay positive though the downs and keep working everyday. If you’re doing the right things, it’s eventually going to come and you can get hot going down the stretch here.